Spring glow: five things to help you get one no matter how fiercely the winds are howling outside your window. (This post includes an affiliate link. See disclosure). I love this product. However, I use it as a highlighter instead of a moisturizer. In fact, I’m loathe to call it a moisturizer because I don’t really feel much moisture from it at all. Maybe if you’re 22 you can wear this as a moisturizer but if you’re 47 like me, it isn’t nearly rich enough. However, Tarte’s Brighter Days contains the faintest sparkles, which help me look dewy and fresh. I apply a little on the bones of my face after applying foundation. Or a apply a layer under my foundation. Either way, I look younger. It’s a must try. 2. A HIIT workout (HIIT stands for High Intensity Interval Training and it’s all the rage among the cool girls right now). Getting your heart pumping is a time honored method for flushing your cheeks. I am partial to YogaByCandace because I like the way she teaches yoga. But, I also like that she offers a range of short high intensity interval training workout videos. They range from three minutes to ten minutes. Do as many rounds as you’d like. If you download her free app to your iphone, you’re never without a workout. If you’re headstand game is less than strong, do another inversion, such as a downward facing dog or one of my favorites, wide-legged standing forward bend. See YogaByCandace break down the pose for you. Fashion blogger Emily Schuman of Cupcakes and Cashmere shared this find recently: a peach blush from Japan that promises to make you look perfectly but naturally flushed. Find CanMake on Amazon. (Note I am not an Amazon affiliate). This comes in other colors as well. This is another really great product for your skin. I put this on and I instantly look more awake. Like the tarte Brighter Days, I put this on my facial bones or I layer it under or over foundation. It’s a win win. A skin-awakening primer that instantly reduces the signs of a bad complexion day to leave the complexion fresh, awake, and hydrated. Looks violet but applies sheer. It can be used by all skin tones and skin types. 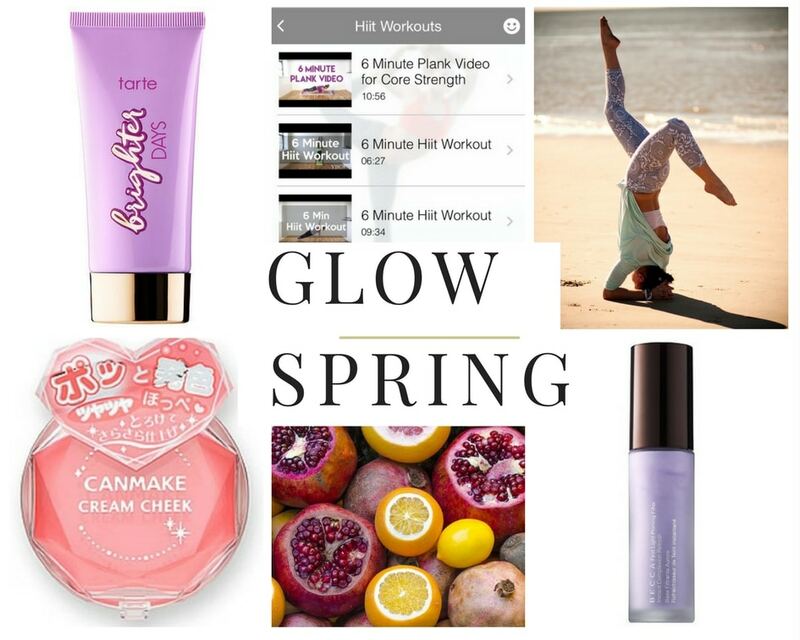 How are you getting your spring glow on? Share in the comments. I love Even Better by Clinique. It helps even out my skin tones fading those blotches that come with age. I use it daily. It’s a bit pricy but I have found that I can purchase it for about half price on eBay. The other product I just love is Exfolikate by Kate Somerville. I use it once a week to remove old skin cells. It makes my skin glow. Thanks to Jennifer for that tip a year ago! I really love Exfolikate too and that reminds me that I need to order some more.